A very simple box in the left corner of the screen that tells you how much time is left on the current block. * I estimate that it is within a few seconds of being correct about 76ish% of the time, but sometimes it can be somewhat off, just due to how the calculations are made. where I must put this file? Is it possible to add (may be optional) timer till forge own block like it is in "classic" NRS? It would be possible to do this but it's a little different that the original idea, might decide to add it in later. Tes, it scans the top 80ish% of forging accounts because that is the most efficient way I've found tk do this, if you do all the accounts, then there's a good chance that pepole won't forge and its wrong just as much. In this scenario I'm mostly sure that given the opportunity, these accounts will forge the block. cool, you can now predict a little better when a third party will confirm your transaction. Did you take it offline? No, its back up now, jnxt had some router issues yesterday, but it is all sorted out. 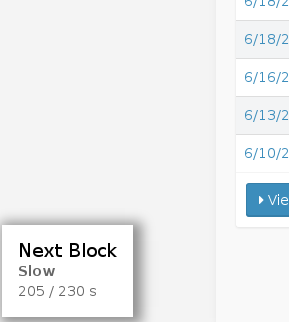 the prediction of when you will forge the next block changes every block, and quite dramatically most of the time, so an average would probably be the best. you can do the calculation yourself pretty easily. (1'000'000'000 / you balance) * 107 seconds per block. I was thinking about a new client which is totally blank in the beginning when you just installed. Then you can add functions, configure features and plugins whatever you need. Nothing extra, you only what you need. This is an NXT LEGO Client. It may be necessary for those who wish to launch their services for their communities or clients. So in this way, a service provider may customize services for his community by adding only required specific functions among those which are available among basic features and plugins of NXT. This idea came from a real life when we wanted to use the blockchain in some real-world business but realized that NXT client is too overloaded and complex for a narrow person. We need a couple of functions specifically designed for our business purposes and nothing more. Of course, we can hire developers to make such platform, but blockchain devs are too tough guys and speak only from 10K which is not an acceptable price for a small or non-profit business and startups. This lego could be a very good starting platform for more wide penetration of NXT into different spheres of life. Do you think it is a good strategy for NXT? NxtBridge is a Wordpress plugin that lets you design your own Nxt online wallet with shortcodes. NxtBridge shows live blockchain data and can prepare Nxt transactions (unsigned tx bytes). You (or your visitors/customers) can sign and broadcast the transactions with our simple Android signing app, or with NxtBridge-OFFLINE. We are currently developing the project - testing and beautifying the Android mobile app as well as adding more transaction types + GUI to NxtBridge. Which lego-bricks do you think would be most awesome to have?